Sunday 20th May Lands End to Redruth. I was wide awake at 6am with the Sun shining through my room window and with a good forecast on the TV it looked as though we were in for a great week and we were. Excellent breakfast in the Conservatory overlooking the Sea. Then we loaded up and paid the 15 pound each charge, excellent value for money. 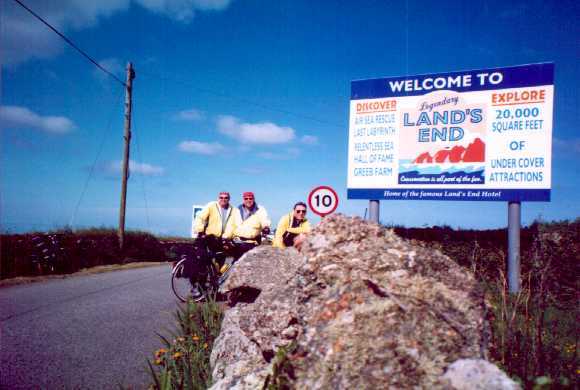 We cycled down to lands end for photographs and souvenirs before our great epic begins properly. Lands End is more of a theme park now with Souvenir shops and Attractions. 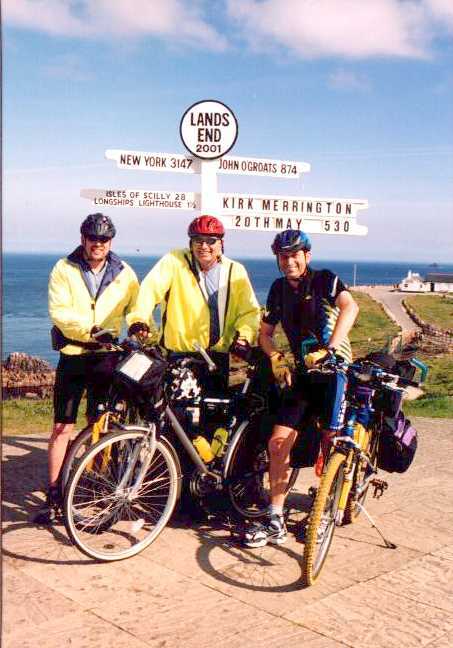 We went to the famous signpost and had some great pictures taken with Kirk Merrington pointing the way. The lady thought we looked very professional and asked if we were on some charity ride. It was a beautiful morning no wind and clear. We Got our cards stamped and sent postcards . Some Motor cyclists were fascinated by out Colin's Bike, one asked had he made it himself. Around 10:30 am we cycled off and headed inland. 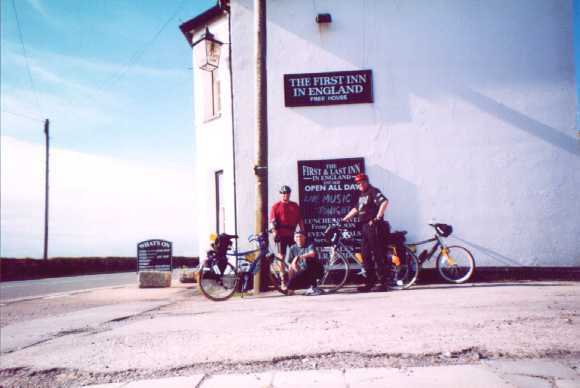 Its quiet amusing cycling away from Lands End The first and last shop, the first and last school, the first and last Pub, Fish and chips shop, garage etc. 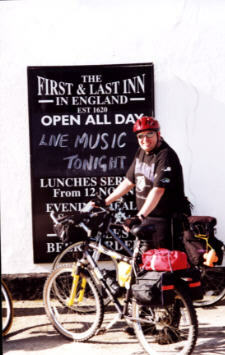 We cycled on and picked up route 3 the Cornish way through quiet villages on the flat with only mild undulations. I got killed because if we had come that way we would have had a downhill ride into Sennen. Its Sunday and we passed the merry Widows and the two pipers stone circle. Legend had it they turned to stone for dancing on a Sunday. Colin quips its Sunday Malcolm will turn into a PUB!! I bet it has a Bow Window too!!! we cycle down note down! To Lamorca Cove. Had a mild altercation with a silly young man in a old Red Mercedes who wanted all the road. Then we turned left over the stream and then bang the first real climb. Out Lamorca cove up and up. There was a guy walking up it wearing only shorts (he looked like a little Cornish Pixie! we were to see him again) and another old guy swinging a giant rucksack around in the middle of the narrow road just as we were passing, and two smart American ladies at the foot of the hill. So we couldn't get off and push we had to pedal it all the way to the to to save face!! We crested the hill then it was downhill into Mousehole so if we had come that way we'd have had one climb!! I got killed for wanting to avoid the "Steep " coastal road. AS we freewheeled down to Mousehole a family were cycling up hill with Baby trailer and tandem. They were not enjoying it at all. As we dropped into Mousehole we got tangled up with a lady and a dog. What's new? Mousehole was a very pretty fishing village we stopped and enjoyed the views then cycled along flat land into Penzance. Along a cycle road. It was amusing how many cyclists were just going along the front to Mousehole to the bottom of the steep bank and then turning round. Especially a Nosy Individual who was cycling along with a guy with a recumbent. We dropped into Penzance well Newlyn first and cycled along the front. 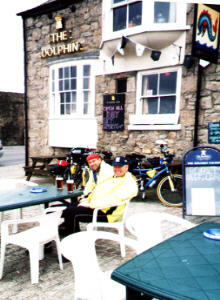 It was approximately 12noon so we stopped at a Pub on the front sat outside and had a pint of Cornish Tinners, a real good pint. As we sat two Sustrans Route rangers cycled by with full kit on, much to Colin and Graeme's amusement. We also saw the Pixie man crossing the road in Penzance, how had he made it so quick??? Maybe he really was a magical Cornish Pixie! We cycled along the front of Penzance bay checked for the cycle rack only to find it had need taken. 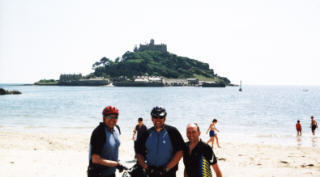 We cycled along the front on a cycle route right to Marazion and St Michael Mount. The sun was shining and the views were amazing across the bay. Graeme and I had a pint of Cornish Tinners and a Pasty while Colin sunbathed on the beach. Only down side was the stamping station at Marazion the lady didn't know what I was talking about, and was very abrupt. Anyway after Lunch we met Colin on the beach and since we were going to do the Cornish Coast to Coast all of 6 miles to Hayle I dipped my wheels and picked up a pebble and carried it through the lanes to Hayle where I threw it in the Bristol channel. 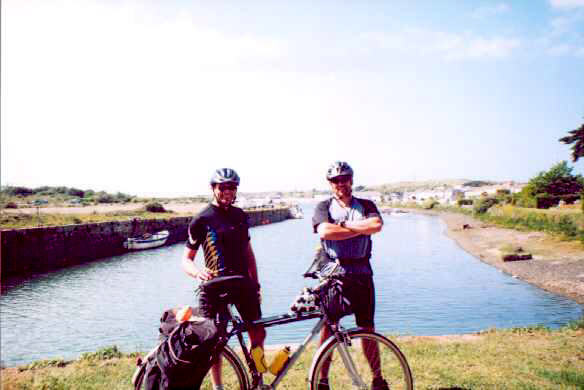 We cycled through Hayle when along by the estuary side , Colin's panniers came loose, and so we stopped in a local car park next to a toilet block to fix them. Colin fixed his pannier rack and then decided my back tyre was flat so he decided to blow it up next thing he snaps off my valve and then blames the fact it was a Claud Butler. Fortunately I had a spare tube so we replaced it and were on our way again.It was quiet amusing stopping where we did as we were repairing the bikes right outside the Ladies toilet block. We cycled from Haile picking our way round some back streets then uphill towards Cambome. We followed the signs and it took us meandering around some small villages and backwaters before spitting us out by the Rugby club and into Cambome town, fortunately Sunday tea time it was quiet. Cambome was an OK town but as we cycled towards Redruth the route took us up and around some old mining villages it was more like Eldon lane all run down and boarded up windows, and it was getting worse, executive decision we bailed out and took the main road into Redruth. After a little working out of the map and the last hill of the day we found the Digs! The lady was pleasant, then this well meaning gent met us took our bikes to the garage but he wouldn't shut up talking, when all you want to do is crash out and shower.. Eventually he got the message and we showered and changed. Tonight we were all in together and the room was basic and the fact we had to pay up front should have been the warning sign. Anyway we changed and just before 8pm after 42 miles, we were walking into Redruth for a night on the Town. It looked a pleasant town apart from no one was about. It was a nice summer evening and we looked around for something to eat. Tried a Pub the Rose Cottage Beer rubbish and the customers were all full of drink and were obviously the local idiots. We supped up and went looking for food. I asked two policemen where we could find a decent meal. No chance in Redruth on a Sunday. Great, then we found this small fish bar that had a small restaurant. There were a couple of people eating and the girl was pleasant enough plus the menu looked good. As we were waiting for the meal the fun started. First a man who was not a full shilling walked past, then a small bald guy in a Black Cowboy Hat (almost Stetson not but quite), came in with a spice girl video under his arm, he was also not blessed with a full pack he shouted and grumbled at the price of the food ordered some chips then marched off down the street without the chips, talking to himself. That was followed with another visitor in the restaurant, another strange guy who sat down and was smiling all the time, then he came across and asked if we would all like a cup of coffee with him and he would pay, I only want to be friendly ,well I looked at Greame's face and politely declined. It was hilarious. Then he started talking to another Guy saying he was lonely, another man walked past who obviously was a link short of a full chain. This town is unbeliveable, Graeme said Someone has left the Door open, they've all got out. Sunday night in Redruth, not recommended neither was the beer in the next pub eventually, at the last one we found some "Flowers IPA" decent pint, but had to put up with a drunk sitting on the steps with a half eaten cheeseburger. Boy oh Boy Redruth is not a place I think we'll be ready to visit again in a hurry. We ambled back to the digs and crashed out.